The garden has a number of statues, sculptures and specially comissioned pieces, both very old and very new. Below are just some of the pieces you can find in and around the garden. Commissions in iron and stone celebrate 500 years of dockyard skills. 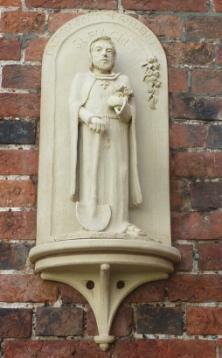 St. Fiacre is the patron saint of gardeners. The statue was commissioned for the garden by Southsea sculptor John Phillipson who also created the several nearby wall-mounted roundels. St. Fiacre is thought to have been born in Ireland in the late 6th century. He later sailed to France in search of solitude and he made himself a cell with a garden, before establishing a chapel and hospice for travellers. All were welcome, except women, and St Fiacre is said to have accomplished miraculous healings of the sick. The statue was presented to the Dockyard by William in gratitude for the Navy's tacit support for his cause. When he came with Ann to dethrone James it was expected that the Navy would act to stop them, however, they took no action and therefore William's army landed unopposed and he took the throne. The statue was restored late in 1967 by Messrs Stoner and Saunders, London. 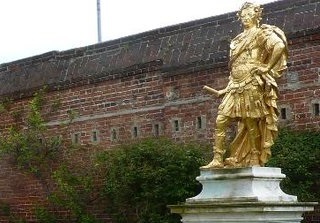 The statue, 'finished in the manner of the Cæsars', in 1718, originally came from the London workshops of John van Nost the Elder. 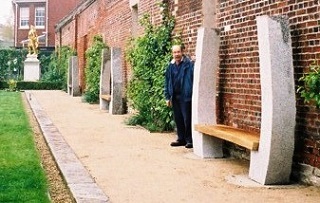 Sculptor Roger Stephens (pictured) installed three sculptured seats in the Porter's Garden on 24th May 2005. Each seat has the shape of the cross section of the hull of one of the three historic ships, Mary Rose, HMS Victory and HMS Warrior 1860. Roger designed the seats. He made them from 6 granite blocks, of total weight 10 tons, that had formed a cart track in Portsmouth dockyard.